NDTV scanned nearly 1,300 articles and cross-referenced this with databases. We went through 1,000 recent tweets of politicians and public figures. The hate speech data was collated from public record, the internet, and our reporters' network. The premise of the exercise was simple: it seems not a day, or a week goes by without some senior politician - a member of Parliament, minister, MLA or even Chief Minister making a hateful comment, be it in the language of bigotry or calling for violence. The rise in use of social media by politicians has only amplified this disturbing trend. Our aim was to establish, as accurately as possible, whether this is 'business as usual,' or if the practice of 'VIP hate speech,' which has a long and troubled history in this country, witnessed an unusual rise in the recent past. The methodology is as follows: we defined hate speech as statements that are clearly communal, casteist, or calls to violence. Some of these instances could invoke action under laws that cover hate speech - laws like Section 295A (outraging religious feeling), Section 153 (promoting enmity between groups) or Section 505 (making statements conducing to public mischief) of the Indian Penal Code. However, experience shows that these laws are infrequently used, especially when it comes to political leaders. We also included comments that may not directly be communal, but are clearly "dog whistling" - loaded against a community or religion in an indirect or coded way. We did not include crude or sexist remarks that are derogatory to women. We selected two time periods for our analysis - the four years from 2014 until now of the Modi government, and the five years from 2009 to 2014, under the second Congress-led United Progressive Alliance. We concentrated on elected representatives - members of parliament, members of legislative assemblies, chief ministers - as well as those holding high offices, like party leaders and governors. The data was collated from public record and the internet, as well as using our network of reporters. We scanned nearly 1,300 articles, and cross-referenced this information with databases such as the Documentation of the Oppressed and Amnesty International's Halt the Hate Tracker. We also went through the 1,000 most-recent tweets (ending with April 2018) of top politicians and public figures. We also looked up what action, if any, was taken against the leaders making hate speech. To be clear: this is far from a perfect record, and in no way are we claiming this to be comprehensive. Readers (and viewers) are welcome to submit any omissions that meet our criteria. 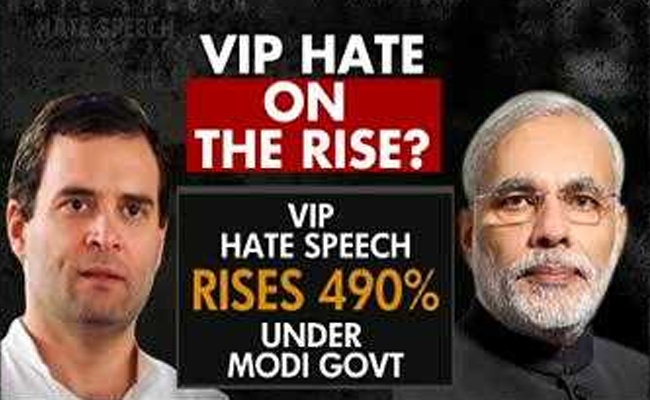 Based on what we found, from May 2014 to the present, there have been 124 instances of VIP hate speech by 45 politicians, compared to 21 instances under UPA 2, an increase of 490%. 90% of hateful comments made during the NDA's current terms are by BJP politicians. During the NDA period, a total of 45 political leaders made hateful comments. Of them, 35 politicians, or 78%, are from the BJP. 10 leaders, or 22% of the offenders, are from other political parties, including the Congress, the Samajwadi Party and Lalu Yadav's Rashtriya Janata Dal. During UPA-2, 21 political leaders made hateful comments, of which 3 or 14 % were from the Congress, which anchored the coalition. From the opposition, politicians from the BJP took the lead, recording seven instances of hate speech. The remaining 11 instances of hate speech from 11 political leaders under UPA-2 include politicians from the Samajwadi Party, the Bahujan Samaj Party, the Majlis-e-Ittehadul Muslimeen, and the Shiv Sena. 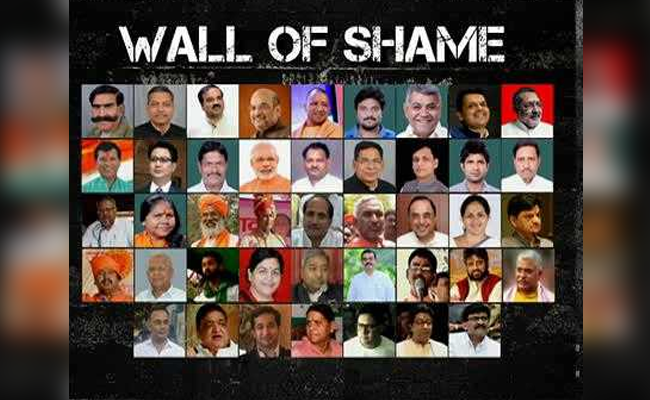 Of the 45 leaders responsible for hate speech since the Modi government came to power, we could only find six cases (only 5% of all instances) of evidence of a politician being reprimanded or cautioned, or issuing a public apology. 95% of the time, the 'VIP hater' faced no consequence. 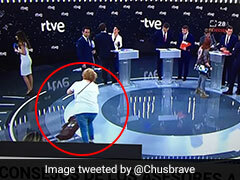 Cases were registered only against 11 of the 45 politicians. In a separate investigation, NDTV had reported on how cases of hate speech against political leaders show little or no progress. In at least two cases, hate speech appears to have paid off. Yogi Adityanath, the current Chief Minister of Uttar Pradesh, was a member of parliament from Uttar Pradesh when, in November 2015, he said "There is no difference between the language of Shah Rukh Khan and that of Hafiz Saeed." In September 2014, he ascribed the rise in riots in Western UP to the population growth of a minority community. "In places where there are 10 to 20% minorities, stray communal incidents take place," he said. "Where there are 20 to 35% of them, serious communal riots take place and where they are more than 35%, there is no place for non-Muslims." In all, there are six such instances of hate speech by the Uttar Pradesh Chief Minister. All were made before he was promoted to his current office. Anant Kumar Hegde was a BJP member of parliament from Karnataka when, in March 2016, he said, "As long as we have Islam in the world, there will be no end to terrorism. If we are unable to end Islam, we won't be able to end terrorism." In September 2017, he was promoted as Union Minister of Skill Development and Entrepreneurship. Since 2014, Mr Hegde has made seven such hate speeches. Three months after being made union minister, in December 2017, Mr Hegde declared that the party would remove the term "secular" from the Constitution, saying "These people who call themselves secularists are like people without parentage or who don't know their bloodline." Mr Hegde is one of three serial 'VIP haters' in poll-bound Karnataka. Shobha Karandlaje, a member of parliament from Karnataka and the general secretary of the Karnataka BJP, has posted at least nine hateful tweets since June last year. These include tweets like the one below. CM Siddaramaiah why ur not withdrawing the cases of innocent Hindu youths ? Why only Minorities ? Dear @SPmysuru Ravi Channannavar prior to Eid Milad, over night you allowed Muslims to erect illegal green arch on govt road, but stopped us from putting Hanuman Posters! From last two years u are distrusting Hanuman Jayanti! What a policing!! 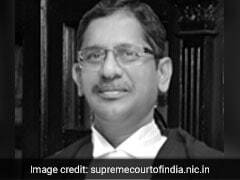 Mr Simha has since been appointed by the government as a member of the Press Council of India. In further proof that hate has no consequence on the careers of political leaders, we found that at least 21 political leaders (or 48%) had recorded more than one instance of hate speech. 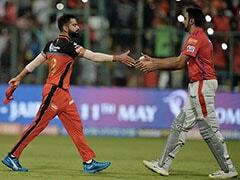 They were not reprimanded for their hateful comments, nor did they issue apologies. Prominent amongst them is T Raja Singh, a BJP MLA from Telangana, who has repeatedly made public speeches inciting violence. In November last year, he threatened to burn down theatres screening "Padmavat." 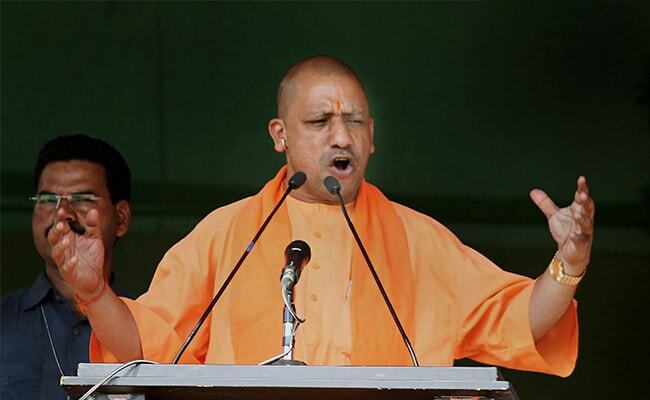 Reacting to the communal violence in Kasganj, Uttar Pradesh, in January 2018, he said, "Every Hindu should carry weapons like lathis and attack other communities' members if they said anything wrong." Since December 2015, Mr Singh has made at least ten hateful comments. 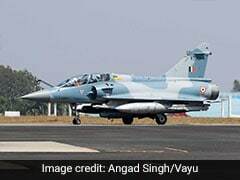 Other prominent repeat offenders include former BJP member of parliament Vinay Katiyar, and Governor of Tripura Tathagata Roy. Mr Katiyar, who finished his Rajya Sabha term just this month, has made at least four communal speeches since December 2017. In February this year, he said Muslims have no business being in India, and should go to Pakistan or Bangladesh. "The cremation ground inside the Taj will be destroyed," he said in another speech in February, claiming that the Taj Mahal was in fact, a temple. "Only our temple will exist and only the pillars that exist around it will stand." A significant number of instances of hate speech invoke the rhetoric of cow protection, a subject that has gained currency under this government. Elected leaders, including MPs, MLAs and even Chief Ministers have used the language of vigilantes while calling for violence against those who kill cows. "There is no such thing (cow slaughter) happening in the state. It hasn't happened in the state in the last 15 years. Has it? We will hang those who kill cows," said Raman Singh, the Chief Minister of Chattisgarh, in April 2017. "I had promised that I will break the hands and legs of those who do not consider cows their mother and kill them," Vikram Saini, a BJP MLA from Uttar Pradesh, said last year. "I will say it straight out, if you smuggle and slaughter cows, then you will be killed. The cow is our mother," Gyan Dev Ahuja, a BJP MLA from Rajasthan, said in December last year. The rise in political vitriol over cow protection in the past four years appears to correlate with a rise in cow-related vigilantism. The fact-checking site India Spend reported that 97% of gau raksha attacks since 2010 occurred under the current government. They counted 76 attacks from May 2014 to December 2017, compared to only two instances in the earlier period (from 2010 to May 2014). Another popular theme in hate speech by political leaders was repeated attempts to delegitimise the Muslim faith, urging Muslims to accept their Hindu ancestry, or inciting fears of a Muslim takeover by playing on fears of an increasing Muslim population. Like Surendra Singh, a BJP MLA from Uttar Pradesh, who said in January this year, "Muslims who assimilate into our culture will stay in India. Those who will not are free to take asylum in any other country." BJP member of Parliament Sakshi Maharaj has also made hateful speeches along this theme. In June last year, he exhorted every Hindu woman to have four children to "protect the religion." "If problems are arising in the country due to population, Hindus are not responsible for that," said Maharaj. "Responsible are those who talk of four wives and forty children." An FIR with charges of inciteful and divisive speech was filed against Maharaj for this speech. : He knows that I am not anti Hindustani Muslim i.e., those Muslims who acknowledge their ancestors as Hindus. Choudhary Babulal, a BJP member of parliament from Rajasthan, issued an open threat to anyone "insulting the [Hindu] community" after the death of a Vishwa Hindu Parishad leader in February 2016. "We do not want unrest at any cost, but if you want to test Hindus, then let's decide a date and take on Muslims," said Mr Babulal. 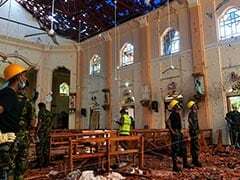 The past four years have also seen political leaders threatening the administration with violence for taking action against members of their own party, religion or their ideological fraternity. For instance, in February 2016, Arun Kumar Mauhar, a leader of the Vishwa Hindu Parishad, was shot dead on his way back from a temple in Mandola, Uttar Pradesh. Five people from the minority community were arrested for the murder. While his family cited personal enmity, political leaders from the BJP and the VHP called a condolence meeting three days later, where several hate speeches were made. At the meeting, Ram Shankar Katheria, a BJP MP and the then Minister of State for Human Resources Development (now the chairman of the National Commission for Scheduled Castes) threatened to kill those who attacked Mr Mauhar. "Today we have lost one Arun, tomorrow it could be another Arun...the killers should be killed," said Mr Katheria. Three BJP leaders were booked for making hate speeches at the meeting. Though Mr Katheria was not named, three weeks after the meeting, he said, ""If cases against the BJP and VHP leaders are not withdrawn within 15 days, if the administration continues to ignore our demand, then a different kind of Holi would be played after 15 days." 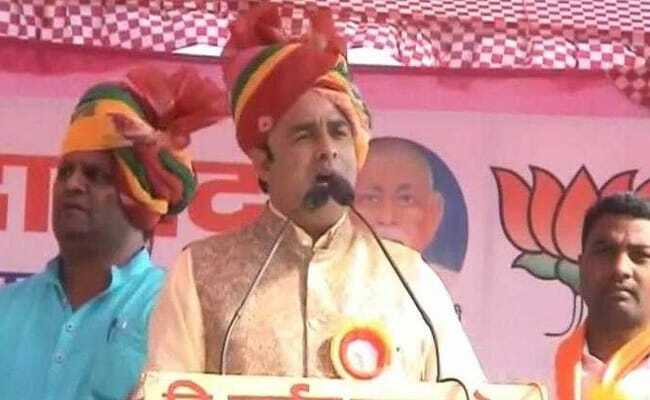 Sangeet Som, an MLA from UP who was re-elected in the 2017 elections, reacted to the media coverage and the arrests of nine men accused of the lynching of Mohammed Akhlaq in Dadri in 2015 by saying, "If action is taken against innocent, we have given a befitting reply earlier and can do so again." The reluctance of the current ruling party to crack down on its hate speech 'offenders' may partly be explained by the fact that the top leadership of the party does not seem averse to playing the communal card, albeit using veiled language. Prominent amongst such instances are speeches by BJP party president Amit Shah, and Prime Minister Narendra Modi himself. "If there is a cemetery in the village, there should be a crematorium as well; if there is electricity on Ramzan, it should be there on Diwali as well; there shouldn't be any discrimination," Mr Modi had said in February 2017, during an election rally in Fatehpur, UP, in the run-up to the assembly elections that his party swept. Ahead of the Bihar election in 2015, at a speech in Buxar in October that year, Mr Modi said, "Nitish and Lalu have conspired to take away the 5% reservation for OBCs, EBCs and Dalits and give it to the minorities. I swear I will die protecting the rights of the OBCs, EBCs and Dalits." During the same campaign, Amit Shah sparked controversy with this comment: "If by any mistake, BJP loses, the victory and defeat may be in Bihar but fire crackers will go off in Pakistan." In the instances of hate speech in the past four years by prominent leaders of the opposition, threats of violence against Prime Minister Modi feature more than once. In October 2017, Bihar MLA and Rashtriya Janata Dal leader Tej Pratap Yadav said "A conspiracy is being hatched to kill Lalu-ji. We will not stay silent. We will skin Narendra Modi." Just a week before this threat, Rabri Devi, Tej Pratap's mother and a former Chief Minister of the state, reacted to a comment by BJP MP Nityanand Rai saying he would cut off any fingers or any hand raised against PM Modi. "I dare them to cut (hands), there are many people who can cut the hands and neck of PM Modi," she said. Earlier this month, Dinesh Gundu Rao, a Congress MLA from Karnataka, declared UP Chief Minister Yogi Adityanath unfit to step into the state. "If Yogi Adityanath comes again to Karnataka, we should show chappals to him and make sure that he is sent back," said Mr Rao. "If a person like him comes to Karnataka, then our mother land will become impure." Mr Rao later apologised for the comment. 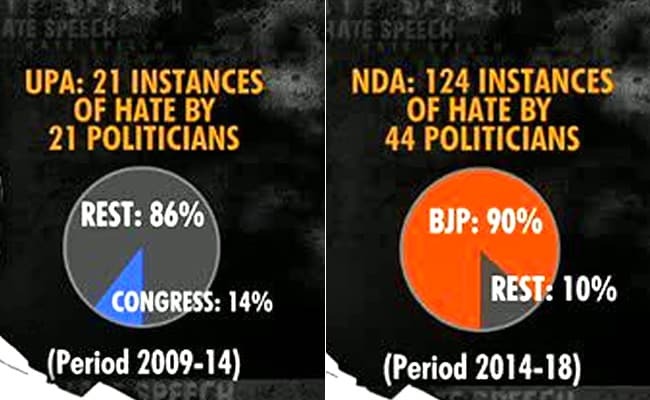 Under the previous government, there were at least 21 instances of hate speech recorded across party lines. Amongst the prominent instances: in the lead up to the 2014 general elections, Rahul Gandhi, then a member of parliament, said, "If the BJP comes to power, 22,000 people will be killed." Also in the run-up to the general elections, Congress candidate Imran Masood said, "If Modi tries to turn Uttar Pradesh into Gujarat, then we will chop him into tiny pieces." Akbaruddin Owaisi, the leader of the All India Majlis-e-Ittehadul Muslimeen and then an MLA in Andhra Pradesh, had issued a violent threat against Hindus in December 2012. "Remove the police for 15 mins, we will finish off 100 crore Hindus," he had said during a speech. He spent 40 days in jail on charges of hate speech before getting bail. The Samajwadi Party's Azam Khan, at the time an MLA in Uttar Pradesh, was campaigning for the 2014 general elections when he said the country cannot be "given in the hands of a murderer," referring to Mr Modi, who was then the Gujarat Chief minister. "When Narendra Modi had been asked about 2002 Gujarat riots, he said that if a dog comes under the wheel of a car, he is very upset," said Mr Khan. "The murderers of Muzaffarnagar should be avenged by pressing the button." The article above states the number of instances of hate speech as of April 17, 2018, the day the database was released. We will be adding new instances of hate speech to the spreadsheet below, and updating the latest figures in the image below.